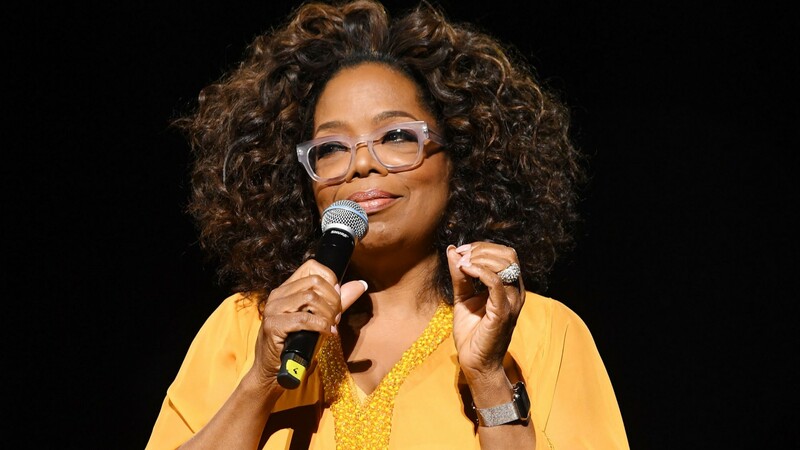 Image: Kevin Mazur/Getty Images for Global Citizen Festival: Mandela 100.
Who wouldn’t want to go on a getaway cruise with the inimitable Oprah Winfrey? Fans who were aboard O Magazine’s Girls’ Getaway cruise over the weekend got an extra special treat: Winfrey handed out tequila shots while wearing her own Oprah-branded pajamas to celebrate one last night on the cruise ship. Frankly, the whole experience sounds like a dream. On Sunday, Winfrey shared an Instagram video of the super-special moment when she carried a tray of branded shot glasses through a crowd of fans who appeared to come from all kinds of backgrounds and covered all age groups. Many of them can be heard yelling their thanks to the media mogul, who hosted the three-day cruise with her BFF Gayle King. According to Entertainment Tonight, the trip departed from Ft. Lauderdale, Florida, and made a stop in Half Moon Cay in the Bahamas for some horseback riding among other once-in-a-lifetime experiences. There were daily Super Soul conversations and, from the looks of it, some truly spectacular bonding moments with Winfrey, King and everyone else on board. King, who told ET the cruise was “just another experience for the girlfriends!” also posted a series of photos on her Instagram, mostly showcasing fans hanging out around the cruise ship’s swimming pool together, as well as taking part in what looked like some kind of trivia game. The sail O-WAY party @OMAGonHAL! Girlfriend getaway cruise in full force @et @nichelleturner & fav daughter @kirbybump is here too!!! “The sail O-WAY party @OMAGonHAL! Girlfriend getaway cruise in full force @et @nichelleturner & fav daughter @kirbybump is here too!! !” King wrote. Fans aboard the cruise employed the #OMAGonHAL hashtag to share their own photos and videos of the trip, which looked like an absolute blast.